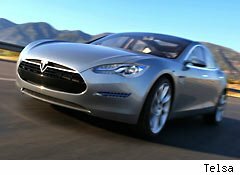 Ready or not, here it comes: Silicon Valley's upstart automaker Tesla Motors (TSLA) confirmed on Tuesday that its groundbreaking Model S, a luxury-sports sedan powered entirely by electricity, was on track to enter production by this summer. It's easy to dismiss the idea of an upstart competing with the likes of Toyota (TM) and Ford (F), but the Model S is no joke: Tesla already has more than 8,000 orders for the car, and each of those orders came with a $5,000 deposit. When you consider that this is a car that starts at nearly $50,000 (and that's after a big tax break), and can run up to almost double that fully loaded, that's an impressive total. Add in the fact that almost nobody has actually test-driven a Model S, and it's clear that there's some excitement brewing around this sleek new machine. But excitement for the next big thing among technophiles and early adopter types is nothing new. Here's the bigger question: What does Tesla's new ride mean for the rest of us? All-electric cars aren't exactly new to the U.S. market, of course. Nissan (NSANY) has been selling its Leaf compact for about a year now, and Ford recently put an all-electric version of its hot new Focus into production. General Motors' (GM) Chevy Volt is arguably also an electric car, with its onboard gas engine serving as a backup generator rather than as part of the driveline, as in the regular hybrids that have become familiar to us over the last decade. Those hybrids, meanwhile, are getting more and more advanced. Toyota just introduced several new versions of its popular Prius, including a "plug-in" version that can be charged up at home to go short distances without using any gas at all. And Ford, which has become Toyota's closest rival in the hybrid game, has promised a plug-in version of its stunning new Fusion sedan for later this year. The Fusion Energi, as it'll be called, might come with enough range for you to drive to work and back without using a drop of gas while offering you the security of knowing that you've got plenty of gas-powered range if you need it. The new Tesla is a different beast altogether, though. Even in its base model, Tesla is promising a 160-mile range on a full charge -- considerably better than the 100 miles or so that you'll get with a Leaf or the electric Focus. Optional, albeit expensive, battery upgrades will expand that to a whopping 300 miles, as much as most "regular" cars manage with a full tank of gas. Sounds good. But will it catch on? Fill'er Up with Electrons ... but Where? There are good reasons to be skeptical of the idea that we'll all be driving electric cars anytime soon. The big one is infrastructure: In a world with gas stations on every corner, not too many folks worry about the range of their cars. But electric cars are a different story. High-speed recharging stations are still few and far between, and recharging your ride on household current takes hours -- it's something you do overnight, not in a pit stop with your kids in the car. Plain and simple, most folks aren't likely to make a major investment in a car if they're not sure it'll bring them home at the end of the day. That alone is likely to limit enthusiasm for purely electric cars for a while. Hybrids offer many of the advantages of pure electrics with the security of being able to refuel at any gas station. And while electric cars are still an unknown for most, at this point hybrids are familiar to most consumers: While you might not drive a Prius or one of Ford's hybrids yourself, chances are good that you know someone who does. And that's where I think the mass market is likely to go over the next decade. Teslas may become the favored ride of well-heeled gadget geeks for a while, but the ever-improving hybrids from more familiar automakers seem much more likely to be the cars of the future for most of us. At the time of publication, Motley Fool contributor John Rosevear owned shares of Ford and General Motors. The Motley Fool owns shares of Ford Motor. Motley Fool newsletter services have recommended buying shares of Tesla Motors, General Motors, and Ford Motor. Motley Fool newsletter services have recommended creating a synthetic long position in Ford Motor.